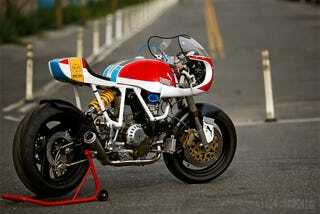 This is a heavily simplified Ducati 900-SS with retro-looks yet done done in ultra modern kevlar-carbon. Yes, that stuff Pagani uses in its own super-cars. It's a one off by Walt Siegl commissioned by Puma. If I were to buy it, I'd probably get read of the Puma logos. Other than that it truly is a tasteful build. For a full read on the specs and build, visit Bike Exif.